Cara Shaw writes that “Ben and I first moved to Raleigh in 1996, when our sons (Sam and Aaron) were 2 and 4 years old. We bought a very old house (built in 1917, I think) on the corner of St. Mary’s and Lane streets, because we wanted to be close to downtown. The house had a lot of character, and also a lot of problems, as one would expect from a house of that age. But we loved the area, and were sorry to leave it two years later when Ben got a job in South Carolina. 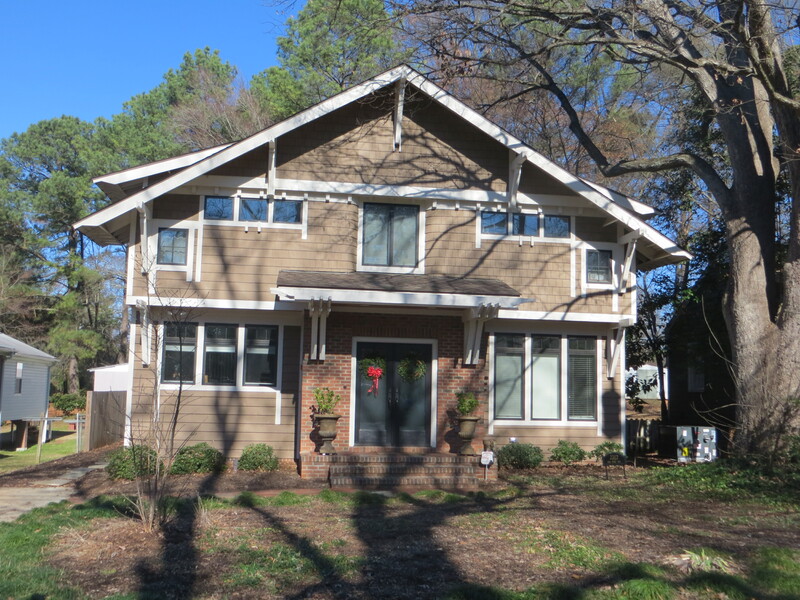 A year later we moved back to Raleigh, and found a new house in a neighborhood outside the beltline. It was a nice place and we stayed there for 14 years, but we still missed being close to downtown. We particularly missed being able to walk to just about anything. Eventually, we started looking around the Cameron Village and University Park areas, checking for homes for sale. We contacted a real estate agent and went to see several properties, and made an offer on one, but did not find anything that was exactly what we wanted. Around the spring of 2011, I saw a for sale sign on the corner of Kilgore and Chamberlain Streets. I called the owner/seller and asked some questions about the property, and said we would think about it. For quite a long time, we came over to see the lot often as we tried to imagine it as our home. Finally, in December of 2011, we called the owner and said we would like to buy the corner lot. We closed on it in February of 2012, having no idea what to do next. The lot next to ours had been sold to a builder, so we spoke with them. We explained that we wanted a house that would fit in with the character of the neighborhood, one that looked like an older home. They brought us to meet with an architect, who showed us several plans for traditional cottage-style homes. He said he could modify any of the plans to suit our needs. We quickly decided on the one with an L-shaped front porch, which looked perfect for our corner lot. Construction began in July 2012, and we moved into the new house in January 2013. Along the way we had to make so many decisions: Paint colors, carpet, flooring, cabinets, lighting fixtures — who knew there were so many things to select for a new house? We really had no clue what we were doing, and it felt like we spent every spare moment researching and planning some aspect of the house. We visited the site at least weekly throughout the construction. When we were finally able to move in, we were relieved and exhausted — but very glad to be here! About the house itself: It has a very open floor plan, with the living room/kitchen/dining area all connected as one big room. The first floor includes the master bedroom and a den/office. Upstairs there are three bedrooms and an unfinished storage area that could be made into another bedroom if we ever had the need for one. There are lots of windows throughout the house, which makes it feel very connected to the outdoors. And possibly the best places are the front porch and the screened porch! A somewhat interesting fact: The address of the house that used to sit on this lot was 607 Chamberlain St., and the front of the house faced Chamberlain. When that house was torn down and the lot subdivided, the new address of our lot became 2400 Kilgore, and the house officially faces Kilgore. But since our driveway is on the Chamberlain side, and the entrance to the kitchen is on that side of the house, we generally use that as the main entrance. In the year since we moved in, we have had no regrets about moving to this location. We love being able to walk to restaurants, the grocery store, the bank, the post office, the library, etc. The walkability and the friendliness of the community have been our favorite things so far. Our next project will be the backyard. We had wanted to have a garden there, and still do. One thing we had not realized when looking at the lot is that it is not flat! It looked fairly level, but once the house was built we realized that the yard slopes considerably — causing soil to wash away down the hill. Last summer we successfully grew lettuce, basil, and peppers. The tomatoes and spinach we planted did not do well. If anyone has gardening advice for us, we could surely use some! The story of our house on Van Dyke Ave started in December of 2006 when I bought the little blue house that used to be on this lot. I lived in it with my sister for the first year until she went to nursing school. After discovering mold in the house, I was able to donate most of the structure to Builders of Hope (http://www.buildersofhope.org/) who moved the house across town (after hauling it away intact!). 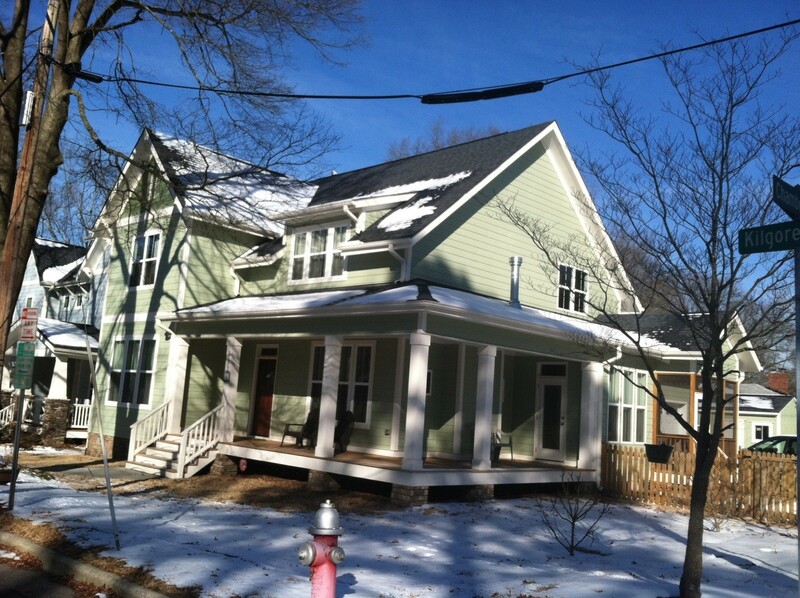 Builders of Hope rehabbed the old structure in a green manner and then sold it. Leoneda Inge of WUNC came early the morning of the move to tape it and interview Nancy Welsh and me. I sat with my neighbors, Lisa and Randy Beebe, sipping mimosas as my house trundled down Van Dyke. Fellow University Park neighbor Mark Robertson’s company Prime Building Company built my home. I got Mark’s name from Mert and Nicoa Dunne. Prime Building did a fantastic job. It is designed by Michaela Mahady and has a great open layout. Here is the link for the new house design: http://www.architecturalhouseplans.com/home_plans/231 The new house is actually situated on almost the exact same footprint as the original home, but instead of being 1.5 stories, the current house is two stories. My fiancé Ian and I share the house with our two dogs Benny and Bella, as well as my sister and her dog. However, this living situation is currently temporary as my sister plans on moving into her own house on … Van Dyke! We love the community in this neighborhood, as well as the close proximity to Cameron Village, NCSU, and downtown. We cannot imagine living anywhere else in Raleigh and feel very fortunate to live in University Park.